Have you ever had one of those days (or weeks) when nothing seems to go your way? When it rains, it pours, right? Sometimes, though, we need a good rain shower to help us appreciate the light that follows. 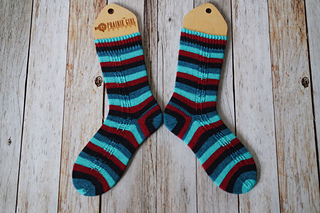 The Downpour Socks will cheer you with a combination of stockinette to show off the yarn and a deluge of garter and slipped stitches down each side of the leg to wash away the boredom. The rain lets up a bit with only one cascade of slipped stitches down the foot. 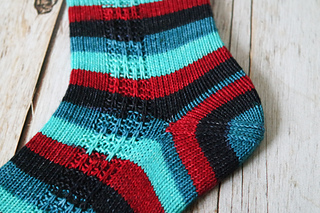 The Downpour Socks are worked from the cuff down to the toe, catching a break in the clouds to add waste yarn for a “forethought” afterthought heel. 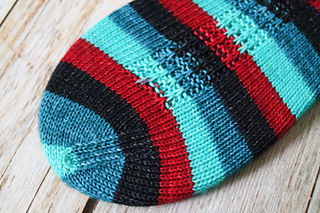 Once the toe is seamed, the waste yarn is replaced with a heel that is identical to the toe. 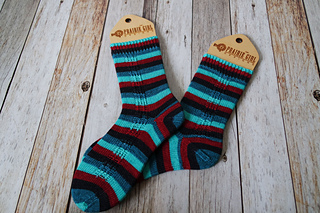 Wear your Downpour Socks to remind yourself that you made it through the rain with no umbrella required!